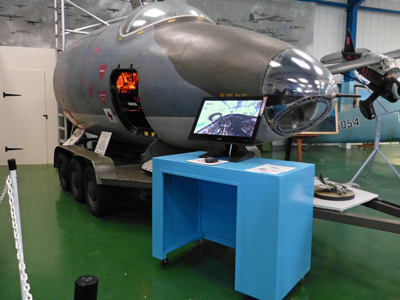 Please see the blog post How a virtual tour helps a museum - the Canberra bomber for further information. Since every element in cockpit, navigator station, and bomb aimer station is named when the cursor is moved over it, the museum visitor has a vast amount of information to discover. All photography has been done with the camera remotely controlled via a laptop computer. The main challenges have been the lack of light, extreme contrasts, and the confined space. To have every detail in focus, from the closest to the lens (1 inch) to the furthest (almost infinite), focus stacking has been used. All photography has been done with available light only, using exposure bracketing. The combination of focus stacking and exposure bracketing means a large number of photos: The cockpit section is based on around 600 21-megapixel RAW images, both the navigator-station and bomb aimer station are based on around 400 photos. This virtual tour exists in two different versions: One is using, if available, the Adobe Flash Player, the other uses HTML5. The Flash version allows viewing in screen mode, the HTML5 version works on almost all devices that don't have Flash (Apple mobile devices). The aircraft is a Canberra B.2, delivered to the RAF in 1952, where it served in various squadron for almost 40 years. It has been stationed, with 245 Squadron, at Tangmere in the early 1960s. General information about the Canberra is available on Wikipedia. Philip Wilkinson, ex-RAF pilot, has provided the names and descriptions for the cockpit section. Geoff Burns, ex-RAF Navigator, has provided names and descriptions for the navigator- and bomb aimer station. Just Flight for their kind permission to use their Canberra engine start-up sound. The Canberra drawing used on the map has been created by Vincent Bourguignon and is used with his kind permission.